DOUBLE ‘A’ FOR MARIGOLD AT AUDIOGALS! 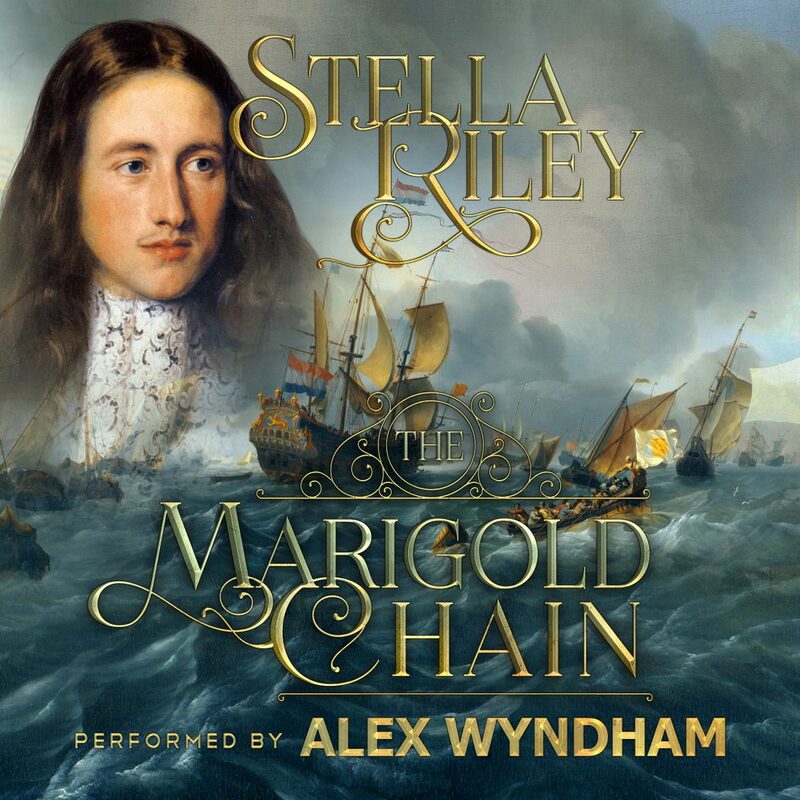 The Marigold Chain is one of Stella Riley’s earliest published works, and, as it’s a long-time favourite of mine, I’ve been waiting not-at-all patiently for it to make an appearance in audiobook format. I first read it in the mid-1980s and loved it; for me, it ticks all the boxes. A brilliant, gorgeous, sharp-tongued hero enters into a marriage of convenience with a practical, quick-witted heroine who doesn’t take any of his crap; set that against the backdrop of the politics and intrigue-laden Restoration court of Charles II, and you’ve got another winner from a writer who really knows how to put the historical into historical romance while at the same time creating a tender, sensual love story. With the exceptionally talented Alex Wyndham once more at the microphone, there’s no question The Marigold Chain is a fabulous audio experience – so just sink into your favourite chair, lock the door, take the phone off the hook and let the world look after itself for a few hours while you get stuck in! Alex Deveril is one of those heroes who, in the hands of a lesser author, could have been easy to dislike, but fortunately, while he’s definitely difficult, Ms. Riley makes him into a compelling and attractive character. He’s fiercely intelligent, handsome, and – when he wants to be – extremely charming; but he also has a tongue that could start a small war, and is prone to using it. Yet he also knows how to say exactly the right thing in a difficult situation and is loyal and honourable to a fault. And clever, pragmatic Chloe is perfect for him. She gives as good as she gets in verbal exchanges and doesn’t hesitate to call him out on his bad behaviour. She’s supportive and insightful, saving Alex from himself on more than one occasion, and the chemistry between them, while it builds gradually, is undeniable. Anyone familiar with Alex Wyndham’s work will know that he’s an exceptionally talented vocal actor whose performances are always highly accomplished and most enjoyable, and that his ability to get into the heads of the characters and accurately convey their motivations and emotions is absolutely first-rate. He’s superb when it comes to conveying his namesake’s acerbic wit and blistering put-downs; wonderful at getting across Alex’s rarely-seen vulnerability in a most memorable scene near the end in which he manages to put his foot firmly in his mouth; and just as good at giving Chloe a no-nonsense, down-to-earth air while also letting us hear the truth of her feelings for her unpredictable husband. The secondary cast – Matt (a bluff northerner), Giles and Danny are all clearly differentiated and easy to tell apart, and Mr. Wyndham’s portrayal of His Majesty, King Charles II – who makes a few cameo appearances – is a nicely judged balance of gravitas and humour. Superbly written and expertly narrated, The Marigold Chain is an utter delight from start to finish. Needless to say, it’s highly recommended. Commenting on an audio book I am still resisting (like all of that ilk) is a little superfluous, but it was a lovely review of one of my all-time favourites and from other reviews of Mr Wyndham’s talents I can imagine he’d have a great time with Alex’s character, as well as the others. So congratulations to you both, Stella. Needless to say, though, my thoughts are with “Hazard” and the resolution of Nicholas and Madeleine’s relationship and a chance to look more closely at Aristide, while revisiting our friends from the 4 earlier Rockliffe novels. And one of the advantages of living in NZ is I get it 12 hours earlier than Europe and almost 20 before US west coast. And while doing this, I will give thanks for Rupert of the Rhine and Greenwich Mean Time. Thank you, Stella, for the “Sneak Peek”. Nicholas is sharing the spotlight with Aristide in Hazard and early feedback is suggesting that the so-far little known Frenchman is giving his lordship a run for his money. Certainly, I fell for him during the writing. Hope you enjoy them both. Next Next post: HAZARD some useful tips!